Monster bug? It's no joke! posted to sites such as Reddit and Cruisers Forum. It may look like a creepy-crawly April Fool's joke - but an expert on deep-sea species says the bizarre giant bug shown in pictures circulating on the Internet is the real deal. "I've seen the pictures, and they are real, and they really do get that big," Craig McClain, assistant director of science for the National Evolutionary Synthesis Center in North Carolina, told me today. McClain specializes in deep-sea biological systems and covers the subject on his Weblog, Deep-Sea News. So he was the go-to guy when pictures of the bug, reportedly hauled up aboard a remotely operated vehicle operating near an oil rig in the Gulf of Mexico, started turning up on Web sites ranging from Reddit to Cruisers Forum. "It's an isopod," McClain said. "It's like the rolypolys or pillbugs that you find in your garden. It's the same group of animals." 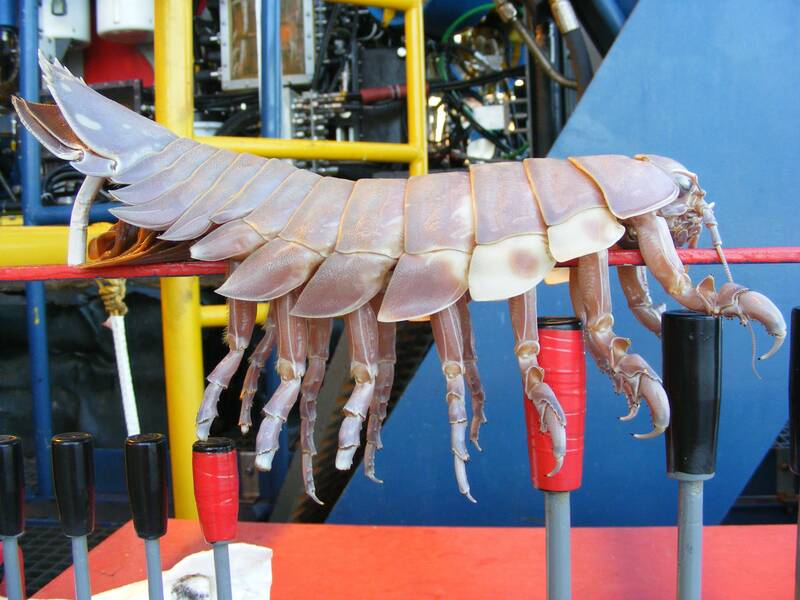 But this deep-sea isopod is no pea-sized rolypoly: The critter grows to a size of 20 inches or more. The bug shown in the pictures that are currently making the rounds is on the "larger size" of the spectrum, measuring 30 inches in length, McClain said. But there are a lot more big bugs out there. 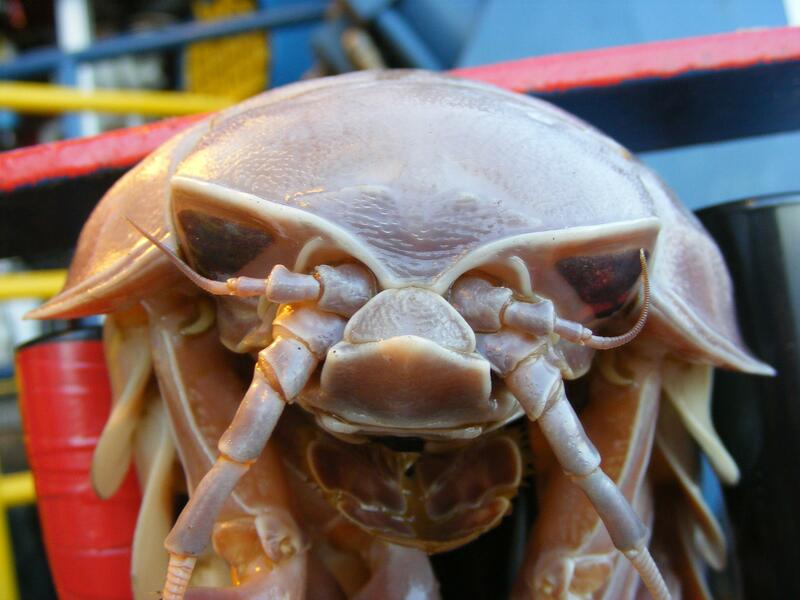 Click for video: See the giant isopod in action. "They're really common in the deep water in the Gulf of Mexico," he said. That's where this specimen of Bathynomus giganteus was said to have been found. The story has been pieced together over the past few days, from reports bubbling up on the Internet forums: The bug was a hitchhiker that apparently latched onto an ROV operating around Seadrill's West Sirius rig in the Gulf of Mexico, at a depth of about 8,500 feet. One photo taken from the side and another displaying a full-frontal view were posted via Reddit late last week by a member who said he works for "a sub-sea survey company." McClain said he received the pictures himself from a researcher who has been active in the area. "We're sort of an online clearinghouse for that sort of thing," he said. My efforts to contact McClain's source via e-mail were unsuccessful, however. The circumstances of the story definitely raised warning flags: It's hard to put your finger on exactly who is providing the images. The shots of the bug don't provide a definitive sense of scale. And April Fool's Day, prime time for Internet pranks, is just around the corner. But McClain told me everything he's seen so far matches up with what he knows about giant isopods. "It's definitely not an April Fool's joke," McClain said. I'll take his word on that. And no matter what you think about the latest pictures, Bathynomus giganteus is no joke. The species was discovered and first described more than a century ago by French zoologist Alphonse Milne-Edwards, and the Smithsonian's National Museum of Natural History has a nice big collection of giant isopods. One YouTube video shows an isopod walking along the seafloor, and another shows the carnivorous bug vying with eels and crabs to chow down on tunafish. Speaking of smorgasbords, I couldn't help but notice that some sources claim the giant isopods are "something of a delicacy" in Taiwan, where they are boiled and served with rice at oceanside restaurants. If those reports are true, that would be one thing McClain didn't know about one of his favorite deep-sea monsters. "I've never heard of anybody eating them," he said.